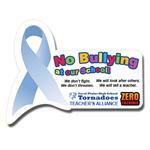 Our Full-Color Awareness Ribbon Magnet has a nice size ribbon die-cut shape as well as plenty of space for your message.Standard Production time is 1-2 weeks. Prices range from $1.31 to .27 each. Just like a magnet, Re-Stick-Its keep your information handy but they don't need metal! The removable adhesive sticks to any surface and can be moved without leaving marks. Prices range from $.69 to $.28 each. 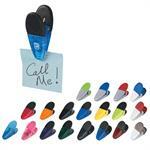 Just like a magnet, Re-Stick-Its keep your information handy but they don't need metal! The removable adhesive sticks to any surface and can be moved without leaving marks. Prices range from $.75 to $.31 each. 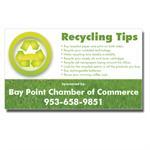 Full-Color Magnets make a bold statement and are an inexpensive way to keep your contact information handy. Prices range from .45 to .11 each. The more you buy, the less you pay per magnet. Show that your organization has heart! Heart-shaped Magnets are a nice way to show you care. Prices range from $1.28 to $.26 each. Car magnets are the modern bumper sticker and our Large Full-Color Ribbon can reproduce photographic images with excellent clarity. You can also use unlimited colors to make a really bold statement. Prices range from $2.29 to .49 each. THE MORE YOU ORDER, THE LOWER THE PRICE! Prices range from $.75 to $.56 each. Full-Color Schedule Magnets are great for school boosters to promote game schedules or you can customize this oversized magnet to say anything. Prices range from .65 to .26 each. The more you buy, the less you pay per magnet. 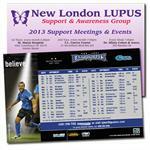 Oversized Full-Color Info Magnets give you plenty of space to provide important information you want to be kept accessible. Prices range from .79 to .17 each. Our stock Domestic Violence Awareness Ribbon Car Magnet is printed in purple with the message "Love Shouldn't Hurt" and can be shipped out fast for your last-minute needs! Prices range from $1.89 to .99 each. Our stock Domestic Violence Awareness Ribbon Car Magnet is printed in purple and teal with the message "Stop the Violence" and can be shipped out fast for your last-minute needs! Prices range from $1.89 to .99 each. 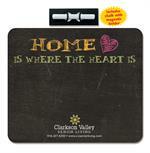 This useful and eye-catching Chalkboard Magnet features a piece of chalk with a magnetic holder so you can turn your refrigerator or other magnetic surface into a chalkboard! Prices range from $4.29 to $2.49 each.